Published by Registry of Guitar Tutors. ISBN 9781905908196. 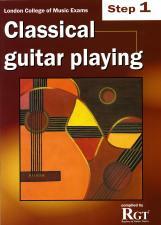 Ideal for those just beginning to play classical guitar, this is the first of a progressive series of ten handbooks. Primarily intended for candidates considering taking the London College of Music examinations in classical guitar playing, this handbook covers all the material needed for the Step One examination and, as well as fingerboard knowledge and musical knowledge sections, it includes pieces such as Jesu Joy Of Man's Desiring by J.S Bach, Hungarian Dance No.4 by Brahms and pieces by Sabor, Benedict and others. Even if you do not intend to take an examination, the handbook provides a structured and comprehensive resource for studying the classical guitar, helping you to develop all aspects of your playing and extend your musical repertoire with pieces from a wide range of styles and periods. These handbooks will help you to: develop all aspects of your playing and achieve your full potential as a guitarist; extend your musical repertoire with pieces from a wide range of styles and periods; improve your sight reading and aural abilities so that you can learn pieces more easily; increase your knowledge of music theory and learn about the historical context of the pieces you're playing. 10 titles are available in this series of official London College of Music Exams classical guitar examination handbooks starting at Step 1 & 2; progressing through Grades 1 to 8. Each handbook covers all the sections of the classical guitar examination including: all the set pieces; all scales, arpeggios and chords; sight reading; ear tests; and spoken tests. In addition there are useful performance tips for all the pieces as well as essential advice on preparing for the examination.